I have been traveling to train in Japan over 50 times over the last 23 years. I’m what you can call a “Jurassic ninja”. But yesterday for the first time I forgot my belt on the mats. I left it right after Nagato sensei’s class and it made me think on the value one attaches to this piece of fabric and what does rank really means. Luckily for my ego, my friend Joe Maurantonio message me that he found it and put it on the big koi at the entrance of the dôjô. And luckily I didn’t forget my key of the dôjô so I got it back. 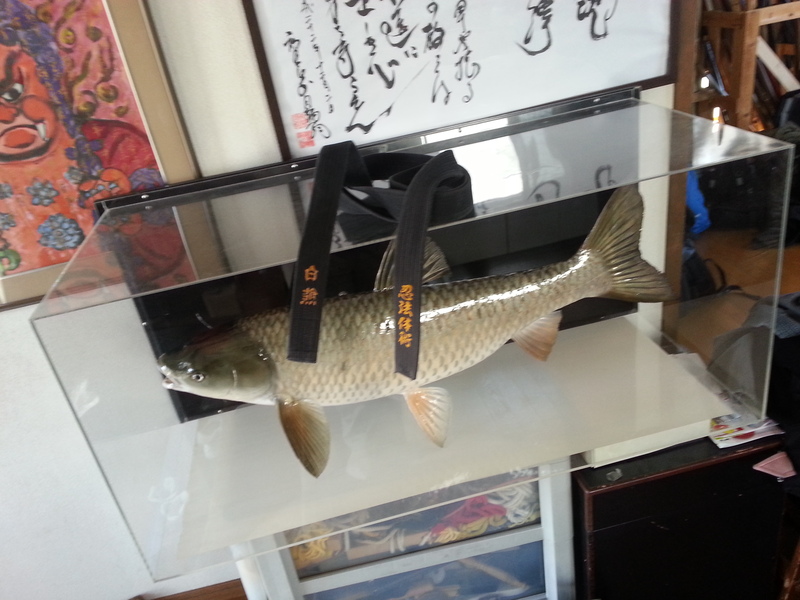 To see my belt lying on top of this huge koi fish* was quite symbolic. As you know we have created with my friend Shiva from India a Bujinkan website** for online streaming and in the past three years we have recorded all the training themes (weapons, ryûha) from the end of the 80’s until the beginning of the Juppô Sesshô cycle (2003). For that I see myself as being quite competent. But is it true? Theoretical 応答能, ôtônô, (competence) is shown by the belt. On the mats it is easy to look good as everyone expect you to be good: “he is Jûgodan, so he must be good”. This is an illusion, a twisted appreciation of reality, and a true cognitive dissonance*** because they judge you on the omote (what people think you are) and do not see the ura (what you really are). Outside of the dôjô the attacker has no clue about who you are in your “dôjô cocoon” and when he comes at you he has no doubt about the outcome of his attack. Unlike what we often see on the mats, he is 200% Tori and sees you as a full Uke. No belt, no rank. There is only reality. Forget the Matrix; there is no blue or red pill, or any plug to download competence in your brain; there are only many years of hard training. Rank is not competence and a belt doesn’t do the training for you. If we witness that everyday in our lives and in the dôjô, the majority tends to forget it. Whoever we are, whenever you are in Japan you are only a student and not a teacher. My brother Pedro explained it nicely in a recent FB post, please read it****. Pedro explains that there is only one sensei, Hatsumi sensei. If you believe yourself to be a 先生 sensei maybe what you call sensei is only 浅才 sensai (a lack of ability). In each class you can see those “sensai teachers” teaching their lack of understanding to their partner instaed of training. They often train with a kyû belt or a young black belt. These “buyû” have no 武勇 buyuu martial prowess, they are simply 不優 buyuu badly skilled! Their 自信 jishin (self-confidence) is 児真 jishin (childish reality). The more unskilled they are and the more they believe in their own value. They train fast in order to hide their incompetence. They inflict pain to their partner thinking that the more pain they give, the more skilled they are. Don’t get me wrong, to inflict pain is ok but why doing it when it is unnecessary? They hide in the back of the dôjô (far from sensei) to teach their own 無能, munô (inefficiency) to their victim of the day. Over the years I have tried to tell them not to do it, but it proved to be useless as they are only listening to themselves and do think they are good. Maybe this is why I have so many high ranks teachers disliking me. A few years ago two guys came to Nagato sensei and said: “sensei we don’t understand” and Nagato sensei answered: “you don’t understand? then go back home!”. They still come to Japan and train with him regularly. But if he can say that, as I am not Japanese people consider me wrong, arrogant or incompetent. But how can it be different? Each time they come to Japan they are promoted. This persuades them of their own value. They have no doubt. When they return home to their worshipers (no one forces the students to pay the training fee) believe their teacher is good because the “Japanese Shihan” give him a higher rank. This is a vicious circle. Another reason for their wrong behavior is that the “ranking race” stops at the Jûgodan level. So these “unskilled individuals” will eventually get to this rank. And having the same rank will consider themselves equal to you. I recently experienced it as a freshly promoted Jûgodan corrected me on a waza I have been training when he was still wearing pampers! There is no shortcut to experience! 応答能 ôtônô, (competence) is acquired through time and the belt you wear is only a piece of fabric. Rank is not competence it is a trap for your ego. So please enjoy your next training as a true 学生 gakusei (student) and don’t forget that being a gakusei means to 学 (learn) 生 (life) and that it is the chance that Hatsumi sensei is offering us. * koi fish: the Japanese bass. For some reason there is a huge stuffed koi in a glass box at the entrance of the dôjô. Maybe a ninja bass, who knows. ** www.koimartialart.com gets about 1500 visits per week. All the dvds from www.budomart.com are available in online streaming. We did that to serve as a “Bujinkan library” of all the waza in order to help the teachers and the community to remember the general forms. A video is always better than a written text as simultaneity is visible. This is not the case in a book where everything is linear. Disclaimer: these are my interpretations and they are not “official bujinkan” material. Well said Mr. Arnaud Sensei. i´ve been folllowing your blog for 2 years now and i´m certain that this post is one of my favorite ones. Nevertheless great post on a great blog from a great man!!!! Gambatte kudasai ..
Pampers LOL This image is stuck in my head for the rest of the day !!! Gakusei !!! The individuals who answer the question: “How long have you been training?” with anything other than: “Not long enough.” 🙂 If Budo is about taking responsibility for oneself, it begins with the answers to the simplest of questions…. Have seen the same… Some people are just too full of them selves… Rather than focusing their energy on gakusei (lerning life or learning for life). This art has saved my life on more than one occation in more than one way… It is not a toy you can say look at how good I am at playing with my new toy… It is for life and life saving, survival in the essence and it works… A “pampers clad” youn man regardless should show respect for experience rather than believing him self wiser… I have learned that each grade makes me more humle than the previous… And believe it should be so, as Konfucious says: “The more I know, the more I know that I know nothing”. It’s really “magnifique” I like so much: “SenSAI”, hehehe. You are Great! !, my friend. I like to be a Gakusei, I started Judo 41 years ago and I’ve been now 24 years travelling to learn from Hatsumi Sôke (which was really when I started learn real Martial Arts). And I agree with you…, maybe many senSAI are coming, but it’s their problem, not ours. Thanks for your post, one more time…. Great article, but those who act like “sensei teachers” won`t refer your words to them. It`s a pitty for the students because they can hardly help themselves (as I experienced). And also bad for Bujinkan, as those “sensei teacher” carry a wrong image of the Bujinkan to the public, and the Dojo. AMAZINGGGG Post! I always think about that. “There is no shortcut to experience”. Ego provides us a lot of traps, and most of all are very common. Another interesting thing that you wrote is of “techniques” used to fake our perception. Inflict pain to the “opponent”, judging by “omote” aspects etc… Several traps of our own ego, I was trapped many times on this way, through my own Ego, that is why the “heart of beginner” must always stand. Thank you for this amazing post! It helps us a lot on understanding of the way! Very nice! Congratulations! Thank you for this post. This is something we all need to keep in mind. I do not understand why this has been allowed to go on for so long. I do understand that rank in Japan is given based on potential, and we should all go out and train hard until we can live up to the rank that was given to us. I wonder however, when a person keeps coming back to Japan and is obviously NOT improving himself and trying to live up to the rank, why give that person more rank? If a person is unskilled, why give him rank and allow him to spread incorrect knowledge? Why not correct his technique and offer him rank at a later date when he deserves it? Thank you again for a fantastic post! Arnaud, you have made an important point. I would say that it is not our job to tell the Japanese instructors who or how to promote, but it IS our job to evaluate what value we get from an instructor. That is a task EACH student must do and we ARE all students. The only thing you prove when you think know it all is that you have a WHOLE lot to learn. Our art is about Life and experience. I also am still alive because of my training in this art. Please notify me of future posts. Perfect technique requires a perfect attack. You should never “rely” on your attacker/s to attack you perfectly ( Japaness Shihan ) . ( IMHO) In most cases you will get little to no chance at evaluating your attackers except for that fleeting first impression. You have to be able to see if he is Skilled , Fanatical , Scared , Bluffing etc etc etc . All you have to work with is his body movement attitude etc . You may have to work this out from nothing more than his touch intention from behind ( unseen ). All the while though , remembering they are just other human with all the same faults , failings , weaknesses as ourselves ( do you know your’s ? ) . If you can’t learn to see , feel the skill of someone in a dojo setting. What chance have you got to work that out in a spit second ? What Chance have you got to pick the weakness / openings in a skilled persons attack ? I try to train to get good enough to survive a Real attack by Sensei or the Shihan’s . As I would suggest do all the good jugodansha , IMHO ! I might be in trouble. I just read my post and as the Kunoichi Taikai is under way. I might have to Guard my valuable bits with care from now on ! My post was very Male centric . You have to be able to see if “he” is Skilled . You may have to work this out from nothing more than “his” touch , intention. Bows very deeply to the Kunoichi’s !!! This is….how I can say…one of the most accurate and, IMHO realistic, description of this theme. In Italy, we disperately need to focus on this. Is it possible that he was right? In that case no, but he might have been right. But this is not what article is about. Focus! I came across this old post recently, and it made me think of things I haven’t thought about for quite some time. As many (probably everyone), I have witnessed people shooting up the rank ladder because they could afford to go to Japan every year / every 6 months. Or I have heard of people being offered Dan ranks if they were to join some Bujinkan group/organisation. “Come in my group, I’ll make you 6th, 7th Dan, whatever you want kid, as long as you bring in your students and their money and I increase my empire”. But even if a rank is given a priori, I am at a loss to understand why it should be given every time they go to Japan; I do not believe that they all have time to catch up to their supposed level within 6 months or a year. I have often wondered why the Japanese fan so much the flames of the Westerners ego by giving away Dan ranks like candies. It is like spoiling a child who becomes rotten, falsely imbued of his/her own worth and unfortunately taking others down with him/her. Has any of you Hastumi’s Westerner close pals raised that with him or any of the Japanese Shihans? It would be interesting to know their response. Often, I wish that there would be no rank, everyone wearing a white belt, no badges, no stars to indicate a level. No Jugodan or black belt t-shirt either, nor a “warrior name” embroidered on a belt. I’m not sure how many people would be able to stand that… Very hard on the ego which needs to be recognised, acknowledged by others at all time and ranks are feeding that disease of the human mind. I’m sure some would still find a way to differentiate themselves, maybe artificially making their white belt look grubby and or worn to show they have trained a long time. All the “stars” could only count on how well known their face is to receive the admiration and respect they think they are due. Everyone would have to judge others competence on the way they move, not on whatever colour their belt is or the number of stars on their chests. Some scales would fall from people’s eyes then! One day, I met a man who had just started training and he said that he wanted to become a black belt in order to teach… Man, you have barely started learning that you already want to teach it?! Aren’t you doing this for you? At the risk of displeasing some, I do not believe that the number of years someone has trained is a mark of their competence. Bewildered and doubting my hearing, I saw a few high ranking people (one for sure had trained for more than 20 years) unable to follow Hatsumi’s instruction of “Don’t move your feet”. That 15th Dan (and his partner) moved all over the place to escape a straight down sword cut. From what I remember the only person who tried to follow the instruction (among all the people asked to demonstrate that principle) was a green belt who was then cut on the shoulder. At least he tried. After Hatsumi repeated the instruction a number of time. I have just recently come across this article through my search of why I feel I am not moving up in rank despite my best efforts, I found this writing about rank to be comforting as it greatly reflects how I have always felt. I am a female that has been training for around 2 years in Budo/Ninpo. I have trained in other martial arts prior to this one, but I found this specific kind resonated with me on all levels. I had the honor to train in Japan in the fall of 2015 and met many different styles and ranks from all over the world. It was quite enlightening as to how people could rank so high but lack the fundamentals of movement, the Bujinkan philosophy, and the basic understanding of physics. Mind you, when I had gone to Japan I was at the base level, I had just got a white belt from the Sensai where I live. Before I had left for the trip, I was training at my own pace, but when I did, I put my spirit into it. I was there for a month and trained in the morning with a 15th dan and the evenings I would rotate between Nagato Sensai, Tanaka Sensai as well as Soke Hatsumi’s classes. I put my heart and soul into my training each class. Many times feeling like I was about to give up because I felt like I was not improving comparing myself to all the others with seemingly higher ranks, I tend to be my worse critic. One class, Nagato Sensai observed my abilities and said he thought “I moved well” and was instructed to get me to Shodan rank. I received my black belt right there under his insistence. I felt like all my hard work was recognized. I understand that rank overall is not important, but I do think it can be confirming and motivating if the intention is in the right place especially when the ego is not involved. I agree that it should not be used as a form of conveying power, but more it should be a form of conveying comprehension and humility, which quite frankly most often it is not. I find the most challenging training partners I have had are rough, confusing centered power with aggressive forcefulness, which can be of higher ranks. I am slender in stature so physics is my friend for sure. Perhaps I have a different perspective for that reason which can be to my favor but also rather frustrating as I can not muscle my way through a technique. Let’s be real here, this is predominately a male-dominated art. I accept and embrace this fact. I am for sure not a feminist, I believe in equality. I definitely love and respect men for the balance they offer, of course, when they themselves are willing to be equally respectful and measured in their approach. So in many ways, the rank is not relevant but only to acknowledge self-improvement. If I can not execute a technique properly in the dojo and falsely believe I can because my rank makes me believe it as such, well, that can be detrimental to my safety if a situation should arise in a real life situation.